please find here attached my CV and please do not hesitate to contact me should you have any opportunity for me. No indication of language pair (or any other information) in the subject line, in the name of the résumé file, or in the text of the message. Plus a CV in a format that may easily be infected by viruses. Result: Recycle Bin. I saw from your web site that your company specializes in English to Italian and English to Spanish translations. 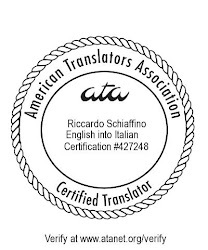 I'm a native speaker of Italian, with a master in translation and five years of experience. I specialize in the translation of plant engineering and legal texts. Attached, please find my CV and rates. Its true that most people aren't very aware of how to market there services and thus make mistakes. Your post is excellent and will help people realize problems of not marketing services properly. omg, you are so right. I work at a translation agency and I get so many of these resumes that are missing information.